All participants entering bulls in an ABBI produced or sanctioned event must be current breeders in good standing with the ABBI. All bulls competing in an ABBI produced or sanctioned event must be registered with the ABBI prior to entry. All bulls must have a DNA verified sire AND dam prior to entry closing time or be subject to penalty. Bulls may be entered with parent verification pending. Prior to entering, the bull must be submitted for registration and assigned an ABBI registration number. A $500 ($250 per parent) penalty will be added to the entry. All bulls must be age verified and EID tagged before competition. Bulls must be in the Owner/Partnership inventory of those entering the animal or under an ABBI competition agreement. The agreement can be found on the website. www.aabinow.com/forms. Bulls must FIRST be ABBI Registered, have a legible permanent brand (fire or freeze) ID number and an original Certificate of Registration prior to age verification. Bulls must be ABBI age verified, no sooner than 18 months old and no later than 34 months old from the date of birth in the registry. Bulls must be verified by an ABBI approved licensed veterinarian according to the ABBI approved mouth chart (L. Man Cropsey, DVM Golden, Colorado), be EID tagged and be verified to be 34 months or less. EID tags should not be placed in animals that are determined to be too old. A copy of an age verification report should be retained by the owner for their records. Remember to ask the Vet for a copy. Copies can be requested from the ABBI office. The fee is $15. Bulls must be branded (fire or freeze) with a permanent legible ID number and have an EID tag in place. Bulls not branded as mentioned herein may be disqualified from any ABBI produced or sanctioned futurity and may forfeit any/all fees and expenses paid. In the event ABBI questions the legitimacy of any animal’s permanent identification markings, ABBI reserves the right to take a DNA sample on any entered animal in order to compare DNA samples, without notice to or consent from the animal owner. Entries will be taken through the ABBI office or website for any ABBI event. Entry open date will be event specific and posted prior to each event’s opening date. Methods of entry: On-line, with credit card payment; Fax, with credit card payment; US Mail with personal checks, cashier’s check, money order, or credit card. An administrative fee of 2% will be charged for credit cards. Mailed entries and mailed payments must be in the office by the close date and time posted. No entries will be accepted without payment. Entry open date will be event specific and posted prior to each event’s opening date. Entry close dates will be one week prior to the event, unless otherwise noted. Entries and entry fees MUST BE IN THE ABBI OFFICE by 5:00pm (Mountain Time) on “entries closed” date (not postmarked by entries closed date). If entering by mail or by fax, a completed and signed entry form containing the ABBI #, the herd number and bull’s name and a copy of the age verification must be included. The entering owner’s name must appear on the registration certificate as the owner of the bull being entered. If the bull is owned by a partnership, that partnership must have an ABBI competition agreement and, at least one of the partners listed as the owner on the registration certificate. If a partnership or lease agreement exists which does not allow for the owner’s name to appear on the registration certificate, entries may still be made, but ONLY if the parties provide the ABBI office with a valid copy of the lease. The entered bull’s name must appear as it appears on the registration certificate or the bull’s registered name will be changed in the registry to match the entry by the ABBI. If entering on-line, on-line entry must be submitted and payment received in the ABBI office by 5:00pm (Mountain Time) on entries closed date. All fees must be paid in full or received by 5:00pm (Mountain Time) on “entries closed” date. Acceptable forms of payment include: personal checks, cashier’s check, money order and Master Card, Visa, AMEX or Discover credit cards. A wire transfer of funds is an acceptable form of payment. A service fee will be assessed for all wire transfers. At all ABBI produced or sanctioned events, entry fees will be event specific and will be posted prior to entry open date. At all ABBI produced or sanctioned events the number of entries accepted may be event specific, and will be posted prior to the entry open date. An animal cannot be dual entered at any single ABBI event. All bulls competing at an event will be required to show a record of a negative TB test and a negative Brucellosis test within one year from the date of the test, and prior to the competition date, unless otherwise approved through the ABBI office. (Please check individual state animal health rules to ensure you are compliant with state animal health laws.) A copy of these tests and a Veterinary Health Inspection will be required. Specific requirements for individual states may differ, so be sure to check with your vet to verify requirements. These tests and inspections must be presented at check-in time. Bulls that do not meet these requirements will not be allowed to unload or compete and will forfeit entry fees. A producer may request additional requirements that must be approved by the ABBI and will be posted as ground rules in entry information. The ABBI Lead Judge may request a VET RELEASE on-site for an injury prior to the event. The ABBI reserves the right to collect samples including, but not limited to tissue and / or fluids, from bulls for any reason deemed necessary, specific or otherwise. No more than 11% of total entry fee may be withheld by the producer for production. 4% of total entry fee may be withheld for ABBI Administrative Fees. An additional $150/entry may be withheld for judges and pen fees. After all deductions, positions will be paid on the basis of one position for every four bulls up to 20 positions. Payouts are made after all results have been audited at the ABBI office. 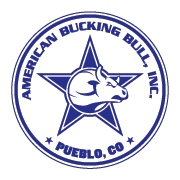 All bulls competing in an ABBI produced or sanctioned event will be bucked using an ABBI approved dummy. Dummy will be applied by designated contract labor. At all ABBI produced or sanctioned dummy events, bulls will be bucked for four seconds. Event producers must use a six judge system. The modified ABBI Average System will be used. All ABBI produced or sanctioned events must use PBR approved judges. ABBI has the right to refuse any judge hired for a sanctioned event. Bulls will be scored using five categories: Buck, Kick, Spin, Degree of Difficulty, and Intensity. Zero (0) to five (5) points, including quarter points, may be awarded in each category, with all five categories added up to form a score of up to twenty-five (25) points per trip, per judge. Any and all electrical devices used to stimulate the animal will not be allowed for use inside the bucking chute. Foreign objects in flank will not be allowed. Any owner not adhering to this rule is subject to disqualification of the animal involved in the particular incident, and/or total disqualification from the competition in its entirety and forfeiture of entry fees. In addition, failure to adhere to this rule could result in suspension and/or fine as outlined in MISCONDUCT & CHEATING. determined to be the size of a 25 cent piece (or reasonable efforts made on these young bulls). At the discretion of a judge or ABBI event representative, if an un-tipped or inadequately tipped animal arrives at any ABBI produced or sanctioned event, the bull will be sent to be tipped off site and you will also receive a penalty. Failure to comply may result in forfeit or loss of any and/or all fees and related expenses to the owner. Bucking order will be determined by random draw. You may not change the delivery of the animal, once the bull has been checked in without being assessed a $250 penalty. If delivery is changed prior to check in, but after the draw, positioning may be changed at the discretion of production. There will be no tie breakers employed at ABBI produced or sanctioned events unless specified in the ground rules, prior to the event entries opening. Prior to entries closing a bull may be withdrawn without penalty or forfeit of entry fees. After entry closing, owners may withdraw animals from competition for any reason. However, doing so will forfeit all entry fees, unless a Vet Release is obtained. In the event a Vet Release is provided to the ABBI Office, entry fees will be refunded, and the bull will be ineligible for entry for 30 days from the Vet Release date. At all ABBI produced or sanctioned events, only designated individuals will be permitted to conduct their specific tasks. Certificate of Insurance by the promoter must be submitted and accepted by the ABBI office, prior to the event. Specific ground rules may exist for an ABBI produced or sanctioned events and will be posted prior to event entries opening. Failure to adhere to posted ground rules will result in disqualification and/or fine. Ground rules will be posted prior to event entry date. If you are traveling from a distance and plan to arrive prior to check-in, you must contact the on-site ABBI representative or the ABBI office at least 24 hours prior to arrival to ensure pen space is secure and available. Animals will then need to be checked in with ABBI officials during the designated check-in time. Failure to contact ABBI in advance could subject you to fine. Check-in will be 12:00pm to 6:00pm. See event ground rules for event specific check-in. The Promoter will agree to all terms and conditions in the Promoter’s Manual. See promoter’s manual for details. Event producers will use a six judge system, judged on the five category system. The modified Average System will be used by taking the combined six scores and dividing by six, the average will then be multiplied by four to give the bull score to the thousandth of the point. This score will be used to determine places. Scores are then rounded to the closest quarter point to get the final score of record. Bulls will be scored using five categories: Buck, Kick, Spin, Degree of Difficulty, and Intensity. Zero (0) to five (5) points, quarter points may be awarded in each category, with all five categories added up to form one (1) to twenty-five (25) points per trip, per judge.